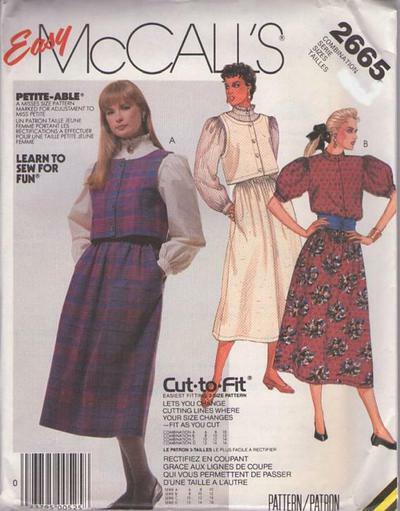 1986, 80s Beginners, Retro Office Clothing Patterns - MISSES' BLOUSE, VEST AND SKIRT: Front buttoned blouse has standing collar, long or short sleeves with gathered cap, shoulder pads and machine-stitched hem. Blouse A has bias neck ruffle and long sleeves gathered into buttoned cuffs. Blouse B has short sleeves gathered into sleeve bands. Front buttoned vest has top-stitching. Gathered skirt has waistband, pockets in side seams with left side opening and machine-stitched hem.